In a piano lesson we learn about sheet music symbols. You find a curved line between two or more notes in a measure or across two measures. 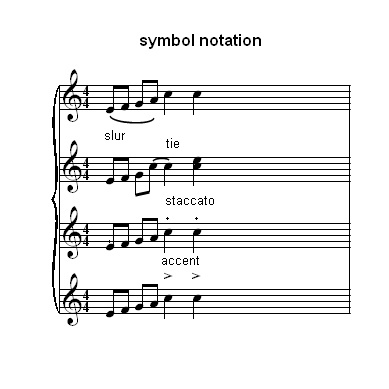 A SLUR is a curved line next to the note head that indicates that the group of different notes is to be played legato. LEGATO is to play together or connected as a group of notes. A TIE is a curved line between two notes of the same pitch. An example of this is across two different measures. You play the note that is in the first measure and continue to hold down that note through the next measure for the duration of the note. Sometimes you find a dot above the notehead. This is staccato. STACCATO is to play the note short and with punctuation. Remember this is not the same as the dot to the side of the notehead which adds length to the note. You can find a > above the notehead or accent. The ACCENT is to play the note with much punctuation. Next in this piano lesson we learn about tempo markings. At the beginning of the treble clef you find tempo markings. TEMPO MARKINGS tell you what speed to play the music. Next, you find markings to tell you at how loud to play the music.